Definition at line 230 of file BranchProbabilityInfo.h. Definition at line 236 of file BranchProbabilityInfo.h. 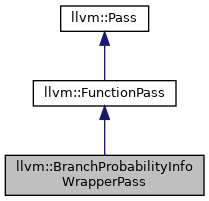 Definition at line 1004 of file BranchProbabilityInfo.cpp. Definition at line 241 of file BranchProbabilityInfo.h. Definition at line 242 of file BranchProbabilityInfo.h. References F(), llvm::BranchProbabilityInfo::print(), llvm::BranchProbabilityInfo::releaseMemory(), and runOnFunction(). Definition at line 1024 of file BranchProbabilityInfo.cpp. 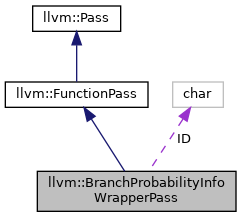 Definition at line 1022 of file BranchProbabilityInfo.cpp. Definition at line 1015 of file BranchProbabilityInfo.cpp. Definition at line 234 of file BranchProbabilityInfo.h.